Set to become the largest designated self-build development scheme in the UK, Graven Hill is aimed at simplifying the process to enable people to achieve their dream of building their own home. Beattie Passive is proud to be involved in this exciting project as a preferred supplier of Passivhaus build systems. 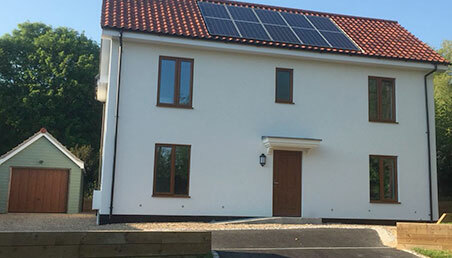 We have currently delivered 46 units with 31 certified by the Passivhaus Institute covering our one and two bedroom coach houses, terraced and detached homes. Additionally, we are working with Self Builders on the ‘Golden Brick’ projects who are looking to build bespoke homes on certain plots throughout the site. As with any Beattie Passive project, all our homes are built, tested and certified to exacting Passivhaus standards. We are excited to bring our unique Flying Factory to the heart of the site where we are manufacturing our Passivhaus frame using local labour and materials: for Graven Hill, at Graven Hill – it doesn’t get more local than that! 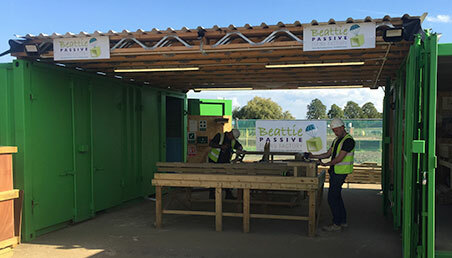 "It’s an exciting time at the Graven Hill development with Beattie Passive bringing their Passivhaus expertise directly to site via their Flying Factory. Here, Beattie Passive are building the first sway of tailored terraced homes to be delivered and erected across the development, ready for homeowners to begin their life at Graven Hill. All residents choosing a Beattie Passive home, from terraced houses to bespoke detached properties, will be benefiting from high quality design and construction as well as all the health and environmental benefits that Passivhaus living brings. For us as a development, having Beattie Passive and the manufacture of their homes on site using local skills and labour, supports our ethos of Graven Hill being a true local community and provides a further boost to the local economy." If you are looking to create your own dream home, why not take a look at our Graven Hill designs for inspiration? Alternatively, we can turn your existing architect’s plans into a Passivhaus reality. » Contact us for a quote for your Graven Hill home – we’re with you every step of the way. All Self-Builders at Graven Hill are required to be financially qualified by BUILDSTORE Mortgage Services Limited - click here for more information and to get in touch. » Click here to read the Graven Hill Development FAQ document.